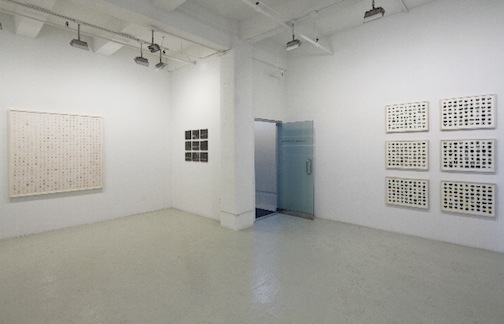 This two-part exhibition will be the internationally-known artist's first solo gallery show in New York since 1999. Surveying more than forty years of formal and conceptual innovation in a range of mediums, it coincides with the publication of Michelle Stuart: Sculptural Objects – Journeys In & Out of the Studio by CHARTA, featuring essays by Lucy Lippard and the artist. Michelle Stuart is recognized for pioneering the use of nontraditional, organic materials in art. Since the 1960s she has exhibited monumentally scaled works on paper, site-specific earth art, multimedia installations, and two- and three-dimensional objects, all reflecting her extraordinary lifelong curiosity and passion for the natural world and the cosmos. Both galleries will feature a selection of the artist's newest works – exquisitely detailed original and appropriated digitally manipulated photographs that she presents in a grid format, an organizing structure that she has used since the early 1970s. 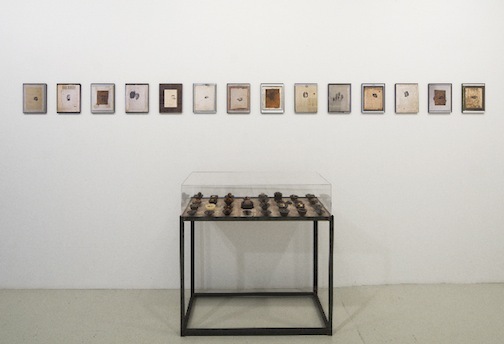 Trajectory of Evolutionary Correspondences (2010), on view at Leslie Tonkonow, is one of Stuart's most ambitious pieces to date, consisting of eighty-eight images and an adjacent table holding sculpted and natural objects (including a preserved horned toad). The piece, says Stuart,"concerns evolutionary growth, marks revealed by change." She describes it as "ranging from microcosmic to cosmic," "a natural progression of all that I've done previously – about life in its most basic form." The passage of time and the forces of change, important themes throughout Stuart's career, began to emerge in the early 1970s in a series of monumental works on paper and related studies. Here, the artist recorded specific geographical sites by rubbing graphite over, or rubbing earth and smashing rocks into, muslin-backed paper. Among the highlights at Leslie Tonkonow Artworks + Projects is #28 Moray Hill (1974). Twelve feet in length, it cascades from the wall onto the floor, a synthesis of drawing and minimalist sculpture. Other works from the 1970s and 1980s will be also displayed, as well as two of Stuart's earliest: Moon (1969), a meticulous pencil rendering of the lunar surface, and Earth Diptych (1968) consisting of two small pine boxes containing reddish soil collected in Georgia, where the artist was living at the time. The centerpiece at Salomon Contemporary is the monumentally-scaled wall work entitled Extinct (1992), a grid consisting of thirty-five separate elements, each measuring eleven by eleven inches, of plants and seeds imbedded or attached onto rice paper, and overlaid with the word "extinct." A meditation on a subject that has preoccupied the artist for more than four decades, the piece is part of Stuart's ongoing series examining transformations and change in the natural world, "using metaphor for relationships in nature, the fragility and impermanence in our world." Many of the plants included, she says, are nearly extinct – found in the rainforest more than a century ago, collected by an anonymous botanist and made into an Herbarium that the artist found. Other plants were collected by Stuart during her travels. Also on view at Salomon Contemporary will be sculpture and wall pieces utilizing seeds from a series that Stuart focused on during the 1990s. Collection Table (for Rumpf) (1997) is a freestanding steel table with a gridded-paper top, holding wax containers of assorted seeds that Stuart collected. 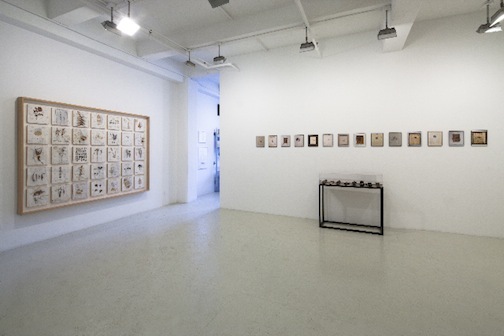 Also included will be her site-specific "seed drawings" of that decade. Stuart says: "I thought of them as calendars. When I pressed the seeds into the paper, the juice, the actual DNA, seeped in. It was moving to me. The piece", she says, "is not meant to be strictly ecological but to capture some mysterious aspect of our environment, a secret that nature holds." Born in Los Angeles, Michelle Stuart lived in Mexico City and Paris before arriving in New York in the late 1950s, where she continues to live and work. Her art has been the subject of solo exhibitions at the Institute of Contemporary Art, London; the Walker Art Center, Minneapolis; the Haags Gemeentemuseum, The Hague; the Wadsworth Atheneum, Hartford; and many other major museums and galleries worldwide. She has participated in numerous group shows and international surveys and her work is in the collections of The Museum of Modern Art, New York; the Whitney Museum of American Art, New York; the Museum of Contemporary Art, Los Angeles; the Moderna Museet, Stockholm; the Kaiser Wilhelm Museum, Krefeld; the San Francisco Museum of Modern Art; the National Gallery of Art, Washington, DC; the Museum of Contemporary Art, Chicago; the National Gallery of Australia, Canberra; and many other distinguished institutions. Michelle Stuart is represented by Leslie Tonkonow Artworks + Projects. Works by Michelle Stuart are currently featured in On Line: Drawing Through the Twentieth Century, on view at The Museum of Modern Art, New York, through February 7, 2011. Michelle Stuart: Sculptural Objects – Journeys In & Out of the Studio (CHARTA, 2010, 184 pages, 152 illustrations) is available for purchase at both galleries. It will be distributed in the spring of 2011 by D.A.P.